Zunplex will put a small file (called "zunplex.xml") into your target folder of your smartphone or MP3 player, to keep track of what songs have been written here by this tool. Consider this typical situation, that you hear later a song and don't like it, and you delete it on your smartphone. The next time you connect it to your PC and let zunplex "Check Target deletions", it will ask you, weather you want to remove this file from your playlist as well. When you go back to Zune software, and it was running while the zpl file was modified, Zune will not refresh automatically, you need to switch to another playlist -and back to the relevant playlist- to be able to see the changes which were made by zunplex. The checkbox must be checked to generate the info file in target. 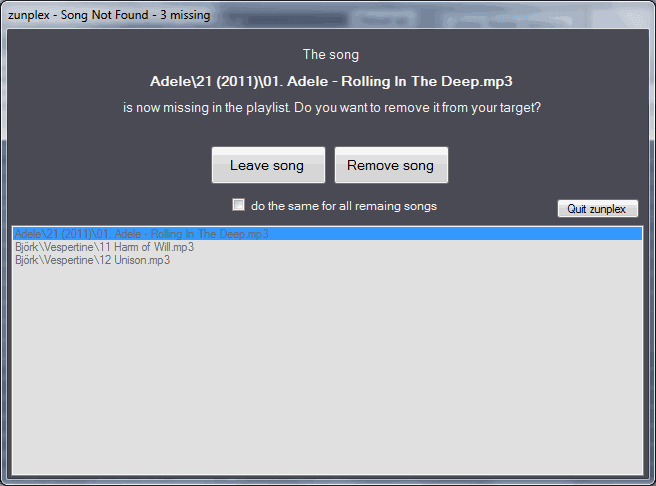 If there were songs found that are missing, you will be asked what to do on the target with this songs. Zunplex will never delete any songs in your source folders (aka from your harddisk) by any of these actions that are possible within here.